It’s the special bedtime story, the birthday traditions, the favorite family game. It’s the stories that are shared time and time again, the inside family jokes, the favorite meal, the annual holiday movie. It’s the snuggles when they are small and the cuddles to mend a broken heart. It’s knowing almost every line to a favorite movie, the name of a well-loved toy, and the acceptance they hate seams on their socks and shoes with narrow toes. It is the reassurance of love, regardless of stumbles, and the promise to lift them up, dust them off, and set them on their path again. We give them roots. We watch them fly, short flights at first, not far from the nest. It’s a slumber party, an afternoon at the mall with friends, a movie date. They cautiously test their wings, and we watch, ready to catch. We smile while our hearts leap with joy and with fear. We reassure as their flights grow longer, more distant. It’s an overnight leadership meeting, a week-long service trip, a month abroad, college in another state. Some days, there are screams of delight, other days tears that make your heart-break, but you listen as they find their own solutions. We grow in trust, in them and in ourselves, and they the same. And, in a blink, we let go. We give them wings. 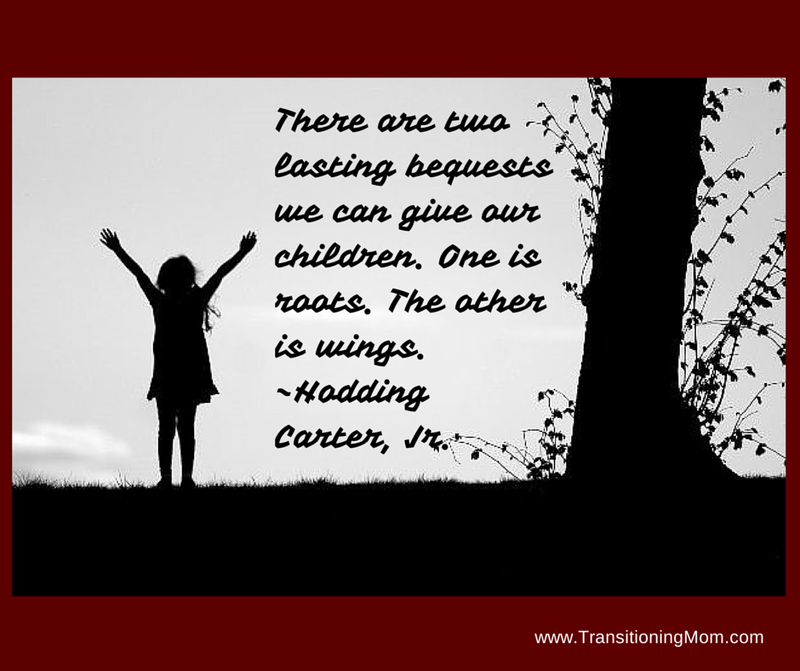 I love the whole idea of roots and wings, and agree they are the most important things we can give our children. The roots are much easier than the wings — especially when they take them thousands of miles away. Thank you for sharing these beautiful thoughts. Roots and wings as they grow and wings and roots as young adults. A conversation for a few years down the road my friend! How do you read my thoughts so well? I so agree — though as I mentioned yesterday — my 13 year old is making me wonder did anything the last 13 years sink in? Oh well. Our 21 year old gave us challenges too and he is in such a good place right now. There’s hope to hang my hat on.